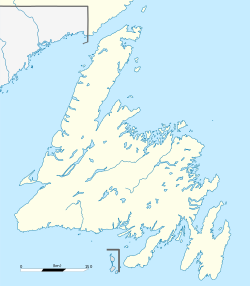 Hare Bay (2016 Population 979) is a Canadian town on Newfoundland's Route 320 in the province of Newfoundland and Labrador. It is in Division No. 7 on Bonavista Bay. Incorporated in 1964, with a current population of approximately 979, Hare Bay is located in a small bay of the same name on the north shore of Content Reach, one of the long, narrow reaches of central Bonavista Bay. Hare Bay was permanently settled in the latter part of the Nineteenth Century by from the scattered island settlements of Bonavista Bay. The growing timber industry, which was stimulated by the construction of a railway and increasing home and world markets, supported Hare Bay almost exclusively until the early 1960s, and created a logging settlement of considerable size and importance. The name Hare Bay in Newfoundland, which also occurs on the Great Northern Peninsula, refers to the presence of the "Arctic hare Lupus americanus which formerly abounded in Newfoundland". Local legend maintains that [c. 1867] a man named Mr. Bemister came to Hare Bay." He lived in a log cabin and set rabbit snares each day. One morning when he checked his snares he found, instead of rabbits, hares. It is said that from that time on, this area was called Hare Bay. The first settlers were brothers named Samuel and Thomas Collins, of Shamblers Cove, Greenspond, Thomas Collins and Samuel Collinsreputedly came to Hare Bay c. 1889, followed soon thereafter by families from Newport and Shoe Cove, Bonavista Bay. The first settlement site filled most of the cove, and was composed of three gently-sloping extensions of better land that extended from the rock and bog." The growth of Hare Bay was rapid: in the 1890s, the population was composed of twenty-six people in four families, all named Collins, who were employed at Collins’s sawmill or in the fishery. Max Collins, Gordon Collins, Rex Collins, Mac Collins, Elijah Wiseman, German Janes, Martin Collins and Bruce Collins at sawmill.Sawmilling first attracted settlers to Hare Bay and by World War II Uncle Petethe rapidly growing settlement offered plentiful employment in pit-prop cutting. Sawmills quickly became the economic focus of the area led by two families, Collins and Wells, who became the major timber entrepreneurs for the many mills scattered from Traverse Brook to the north and Trinity, Bonavista Bay to the south. As the population swelled (52 in 1901, 199 in 1911, 262 in 1921), the land-based forestry resource became Hare Bay’s prime occupation. In 1903 Theophilus Wells, formerly of Gooseberry Island, came to Hare Bay and established a sawmill on a 16-ha (40 acre) site at nearby Lockyer’s Bay in addition to building six water-powered mills. Both Collins and Wells maintained an Theophilis (Lala) Wellsinterest in the Labrador fishery and Wells was involved in local schooners supplying Hare Bay from St. John’s. The Labrador Schooners frozen in the bay.fishery, conducted from such ships as the Irene, Western Queen, Good Hope and the Ethel Collins (which collided with a vessel off Torbay Head, claiming the lives of four Hare Bay men). Early family names in Hare Bay at this time included Roberts, Lane, Taylor and Vivian in addition to Collins and Wells. In 1955 Bowaters started a barking operation at Boucher’s Cove on the south side of Bonavista Bay employing 100 men. Until 1958, when the Bonavista North Shore Highway was completed, Hare Bay had functioned as the road-head of Central Bonavista Bay leading to Gambo and Glovertown, which were railway and service centres for the region. Hare Bay was a natural point of resettlement for isolated island families anxious for salaried employment and increased services. Fire of 1961, South SideIn 1961 a massive forest fire swept central and northern Bonavista Bay, Fire Patrol Boatdestroying homes and large stands of valuable timber – the main source of employment in Hare Bay and other nearby communities. Thereafter the population of Hare Bay slowed considerably as over sixty families left the community for jobs elsewhere, with many of them moving to Toronto. Employment for the remaining residents of Hare Bay was found in Gander, where there was still competition among Bonavista Bay inhabitants similarly affected by the fire through losses in local employment. Theophilus Wells constructed the first school in Hare Bay (a Salvation Army school) by 1911. Although the first census of the community, taken in 1891, showed twelve Church of England adherents and fourteen of the Methodist denomination, the Salvation Army quickly gained primacy. First brought to Hare Bay in 1899 by Samuel Collins, early followers worshipped in his store loft until the first Salvation Army citadel was built in 1906. A second citadel was constructed, under the auspices of Theophilus Wells, in the east end of Hare Bay and this building was used until a new citadel was constructed in 1945. In 1952, following the resettlement of the residents of Newport, the merchant of that community took over a shop in the central portion of Hare Bay and donated some of his land for a large, new Anglican Church and school. With the influx of settlers from Fair Islands, many of them Anglican, a larger church was built and it was consecrated on December 15, 1963. United Church residents (whose numbers also increased significantly in the 1950s) had used a school for religious services until the building of a church which was opened in 1961. The Pentecostal Assemblies first came to Hare Bay in 1949 and erected a church in 1950 which was replaced by a new church and pastor’s residence officially opened on July 3, 1977. Until 1952 only the Salvation Army operated a school in Hare Bay. In that year incoming residents from Braggs Island (who were mainly United Church) floated their two-room school to its new home in Hare Bay and the Anglican population, formed mainly of former Fair Islands and Silver Fox Island residents, opened a three room school. Although the United Church school was destroyed by fire in 1954 it was completely rebuilt, and three schools (one of each denomination) operated in Hare Bay until 1974. An integrated academy, named for Hare Bay midwife Jane Collins, replaced these schools in that year. In 1982 Hare Bay students attended Jane Collins Elementary School, Brown Memorial Junior High School and Dover All-Grade School for Grades Ten and Eleven. As of 2013 Hare Bay is the site of four churches, about seven retail outlets and several small convenience stores. The town is served by an elected council and has a volunteer fire department. Hare Bay - Encyclopedia of Newfoundland and Labrador, vol. 2, p. 830-833.